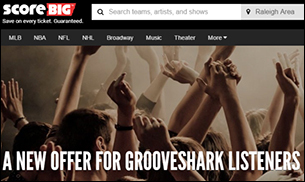 (Hypebot) – When Grooveshark was finally shut down by legal pressure from the major labels, Universal Music Group ended up with the domain name. Now they've apparently decided to monetize it with "A New Offer To Grooveshark Listeners." Type in the URL for defunct music streamer Grooveshark.com and you are now taken to ScoreBig.com where a banner reads "A New Offer To Grooveshark Listeners." The "offer" is discount tickets toDetails of the deal are unclear. ScoreBig is a well funded company, having attracted $54.5 million in investments since launching in 2009, but for now the domain remains registered to Universal Music Group.